Is this history? It will be eventually but rest assured, the snake is still alive and well and I’m sure it will be for some time! It’s definitely Geelong and District. Hadn’t had my breakfast and was about to have a shower when the front door bell rang. TOO EARLY for legitimate visitors. Decided the noise would go away so was getting ready for the shower when the door bell rang again, then there was banging on my front window. Decided I had better check it out … and there was my neighbour saying come out here – this way, not towards his place! He was in his PJs and pointing towards his place and the roller door of his garage. WOOPS – a snake! Neither were experts on snakes so we weren’t about to go much closer! It was slowly moving across the front of his garage. He said it had tried to climb up the garage door but came back down! Quick thinking – I told him to keep an eye on it while I grabbed the camera. And here’s a word of warning for ANYONE in a similar situation – get your camera ASAP and take a photo. So I took the photo above as the snake moved slowly towards the green and yellow garbage bins along the fence beside the garage. It slid between two bins and hid between the bins and the fence. I told my neighbour to keep an eye on it while I went inside to search for a phone number for a snake catcher. The sun was a little bright outside and I already had my computer fired up on my dining room table so opted to use that to find the number. The first snake catcher said he couldn’t come but would SMS details of someone else to ring. Rang the second number and Darren said he would be about 15 minutes. He told us not to try to get closer but keep an eye on things until he got there. He said if it had been on concrete it would be looking for somewhere to hide. My neighbour was a little worried about his small dog as there was a gap under the gate beside the bins where the snake was hiding. I encouraged him to go back through his front door and get something to block up the gap so the snake wouldn’t go into his back garden. In the meantime I kept an eye on the bins and the snake’s hidey-hole. After the gate was made safe we both kept a vigil out the front. Another neighbour came out about to head to work – I suggested she keep her little kitten safely locked inside until the intruder was captured. The snake catcher arrived and I showed him the photos. He was relieved to see that it was a carpet python – not a local and possibly an escaped pet! He pulled the three bins away from the fence – no snake. Turned the bins upside down and checked inside and out – no snake! A bundle of leave in the corner were moved aside – no snake. 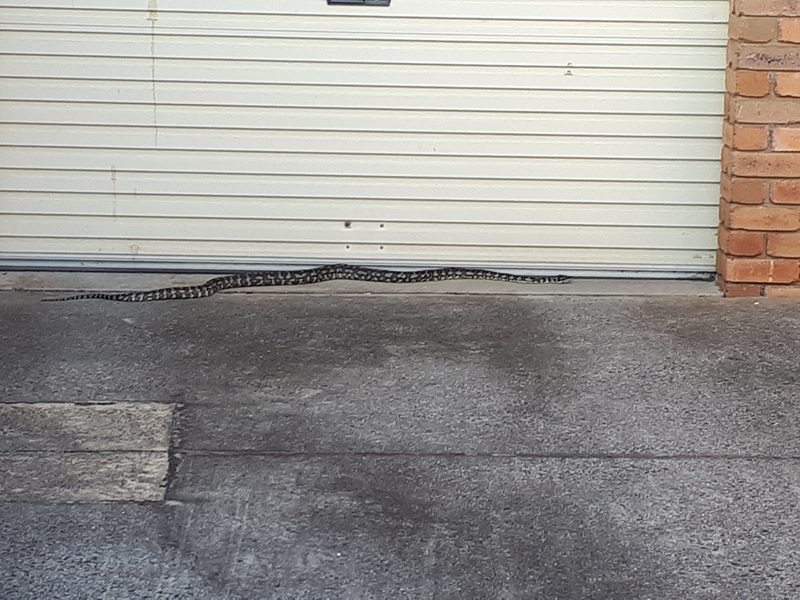 My estimate was that it was 5-6 feet long, possibly a little longer – I’ve just been out to measure the garage door remembering where the snake lay … 180 cm so 5-6 feet is pretty close! The snake catcher arrived soon after 8.0. am and left close to 10.00 am – so he searched high and low for a long time before admitting defeat. We were so sure we had kept our eye on it and it hadn’t reappeared from behind the bins. The two possibilities – climbed the fence half covered with a vine and escaped that way, or down a narrow gap between the concrete and fence and got under the concrete slab. Bottom line – the snake was nowhere to be seen. And that’s why the photo was so important – he was able to confirm that it wasn’t a poisonous snake – although we would be encouraginge our neighbours to keep their small kittens locked away safely! The snake catcher gave us a lot of tips on what the snake might do – bake in the sunshine on the fence or up in the gutters or a myriad of places. By then the snake catcher’s van had attracted a crowd out of the front in our small narrow street. I had to send the photo to one girl who said her husband would never believe her when he got home! Another good reason for getting a photo of the snake! And still another good reason for grabbing the camera / phone … we KNEW it wasn’t a false alarm and our eyes playing tricks with us! I couldn’t believe it when the snake catcher moved and checked the three bins – we were 100% certain the snake would be there. It’s a tad disconcerting that it wasn’t found but definitely reassured because of that photo. Should we be thinking of a name for our carpet python if it returns? 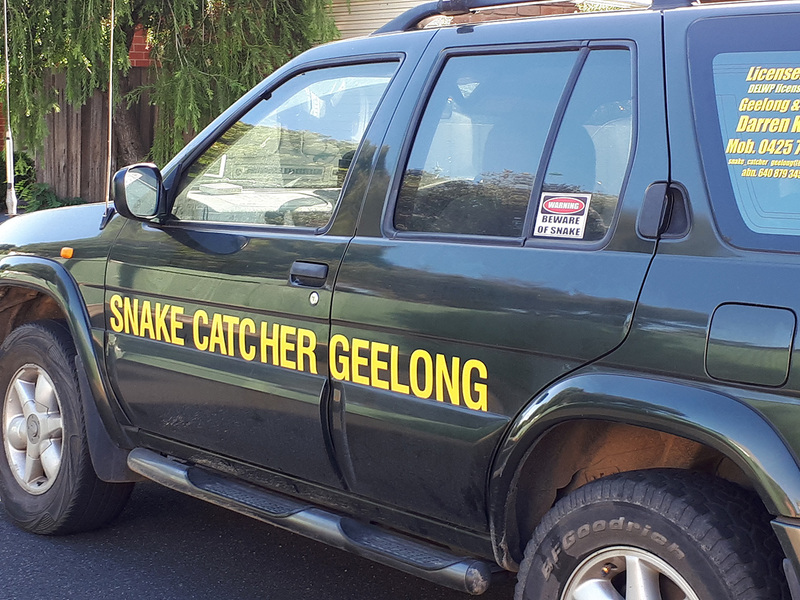 Of course someone may have lost their pet python in Geelong and recognise it. Then again, it may have escaped as a baby and has grown much larger during it’s time of freedom! Previous Point Henry – immigration and tourist mecca! I didn’t know my snakes well enough to be certain but it was reassuring to have the snake catcher confirm it was a non-venemous one. Living so close to the river you often keep your eye out – in fact there are a number of signs along the river bank warning of snakes and swooping birds! There was also one when there’d been water over the path warning of slippery banks! And exercise is supposed to be healthy! I imagine you would see more than most of us with your escapades along the river and the river banks! Tigers, blacks and browns are usually reasonably easy to identify. I suppose I’m more likely to see them, but the majority have been on the walking track between Breakwater and Fyansford where these guys were. I’m getting quite a collection of photos too. Some are quite pretty! Little else worries me, but snakes sure do..no matter venemous or not..
I’m with you – not keen on snakes of any type – even rubber ones!